Beagle Bay Mission was established by the Cistercian Order of the Strict Observance (Trappists) in 1895. It accommodated Aboriginal babies, children and young people up to age 20. From 1901 the Pallotines were involved in running the Mission as part of the Catholic Diocese of Broome, and from 1907, the Sisters of St John of God ran the Mission school and girls' dormitory. From 1905, the head of the government departments responsible for Aboriginal welfare was the guardian of children at the Mission and from 1972 the head of the departments for child welfare was the guardian of any children deemed to be 'native wards' or 'wards of the State'. In 1976, Beagle Bay became a self-governing community. Beagle Bay Mission, located on the Dampier Peninsula 180 kilometres north of Broome, was administered by the Catholic Diocese of Broome. The Mission was staffed initially by the Cistercian Order of the Strict Observance (Trappists) and then from 1901 by the Society of the Catholic Apostolate (Pallottines). In 1907 they were joined by the Sisters of St John of God. The 1899 report to the Protector of Aborigines showed that there were 67 children at Beagle Bay mission who were 'nourished and instructed' and 'have created a want of civilised food' and other practices that helped them, in the belief of the missionaries, give up the 'savage' way of life. I have 11 [lay brothers] and one school-master. Their various professions are carpenter, blacksmith, bricklayer, settler, [shoemaker], three farmers, and other tradesmen…[Mr Randle the school teacher] has been here since May last. He came shortly after the previous teacher (Father Reusmann) was drowned. [Randle] is a probationer at present, with a small salary [which was not paid by the government]. Walter was asked what subjects were taught ('Reading, writing, arithmetic, music, object-lessons, religious and Bible history'), how many hours of schooling per day ('Three and a half hours daily. In the morning from 8 to 10; in the evening from 2.30 to 4.') and how many children attending school ('31; 21 boys and 10 girls.'). In other words, you keep them occupied outside school hours in order to give them technical education? - Yes. Do you find that the best way to keep them fully occupied? - Yes. You believe, then, in teaching them the nobility of work? - Yes. That is my principal aim. Walter also explained that all children at Beagle Bay came from either Broome, Disaster Bay or Beagle Bay locations. It seems to me that the Trappists lost heart in the work, and as Bishops Gibney and Kelly were very anxious to continue the work, Bishop Kelly applied to my Superior in Rome to send out some missionaries…The Trappists got £2,640 for the property. Instructions have been given to the Protectors, Police, and Travelling Inspectors to try and collect these children and send them to the Beagle Bay Mission…There are now 10 sisters at this Mission. There is therefore now no reason why the girls, both half-caste and full-blooded, cannot receive the same care and attention that they do in the institutions South…Some little difficulty is experienced in getting the parents to part with these children; they cannot be forced, unless it is proved that the surroundings are likely to bring the children to lead vicious lives. However, every persuasion will be used, and I think it probable by this time next year a great many of these children will be at the Mission. The State Solicitor's Office (2005, pp.16-17) reports that from 1908 children 'who appeared to be neglected' were transferred by authorities from 'all over the Kimberley' to Beagle Bay Mission. Choo (2001, p.298-299) writes that government reports show there were 111 children at Beagle Bay by 1909 and from 105 to 136 children each year between 1910 and 1936. Some children did not have parents living at the mission. When Choo interviewed some of these women (p.163) she found that they recalled 'with great fondness the love and care given to them by the adults in the mission colony, who were allocated to them as "adoptive parents", and' by older girls who were given the responsibility of looking after younger girls 'as a means of maintaining some order in the dormitory'. Choo reports (pp.159) that right up until the 1950s, there was an expectation throughout the Kimberleys that all children, Aboriginal and non-Aboriginal, needed only a primary-school education. However, from the 1930s (pp.160-161), some children were chosen to receive further education and were sent to Catholic boarding schools in the south of the State. 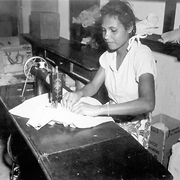 From 1955, a number of teenage children were sent from Beagle Bay to the Pallottine Centre in Riverton to continue their education or other training. Schooling at Beagle Bay included subjects such as 'spelling, reading, writing and arithmetic, and received religious education, which included catechism and hymns in Latin'. World War II (Choo, p.178) put additional pressure on staff and children at Beagle Bay Mission when Aboriginal people, including children from the Holy Child Orphanage in Broome, were evacuated to Beagle Bay in 1942, remaining until 1945. Reports of the Child Welfare Department (Signposts pp.97, 99) show that children, who included those who were wards of the State, were living in separate boys' and girls' dormitories until at least 1974. The State Solicitor's Office reported (2005, p.17) that Beagle Bay Mission, located on the Dampier Peninsula 180 kilometres north of Broome, was a Catholic mission until the mid-1970s but the Pallottine Fathers continued to run the school and hospital and look after the boys in the dormitory until 1976 when it became a self-governing Aboriginal community. Government reports (Signposts 2004, pp.97-99) show that children continued to be placed with foster parents at Beagle Bay after the institutionalised child 'care' ended. Beagle Bay Mission was mentioned in the Bringing Them Home Report (1997) as an institution that housed Indigenous children removed from their families. The Cistercian Order of the Strict Observance (Trappists) established Beagle Bay Mission. The Pallottines (Society of the Catholic Apostolates) were involved in running Beagle Bay Mission as part of the Catholic Diocese of Broome. The State Archives Collection contains records, including items that name residents of Beagle Bay Mission and administration items. The Chief Protector of Aborigines was the legal guardian of children at Beagle Bay Mission. Commissioner of Native Affairs was the legal guardian of children at Beagle Bay Mission. Commissioner of Native Welfare was the legal guardian of children at Beagle Bay Mission until 1963 when he could regulate the 'care' of Aboriginal children. The Roth Royal Commission inquired into conditions and practices at Beagle Bay Mission. Neil Carter of the Kimberly Aboriginal Law and Cultural Centre describes Beagle Bay Mission as a 'Stolen Generations Mission'. The Aborigines Department was resopnsible for the Aboriginal children in Beagle Bay Mission. The Aborigines Protection Board had responsibility for the welfare Aboriginal children housed in Beagle Bay Mission. 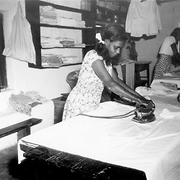 The Chief Executive Officer of the Department for Community Welfare was the guardian of children at Beagle Bay Mission who were deemed to be 'native wards' or 'wards of the State'. Children were transferred between Drysdale River Mission and Beagle Bay Mission. Girls, young women and Sisters from the Holy Child Orphanage at Broome were evacuated to Beagle Bay Mission during World War II. 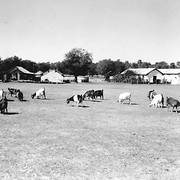 When Moola Bulla Station closed, many of the children were transferred to Beagle Bay Mission. When it closed down around 1898, some of the children from Orfelin Ecole (Orphan School) in Broome were sent to Beagle Bay Mission. After Beagle Bay Mission closed children continued to be sent from that community to Pallottine Mission Centre. 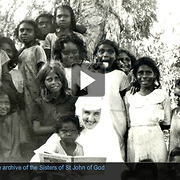 Sisters of St John of God ran the school and the girls' dormitory at Beagle Bay Mission. The State Library of Western Australia holds many photographs and other historical information about the Beagle Bay Mission. State Records Office of Western Australia holds records for Beagle Bay Mission dated from 1898. 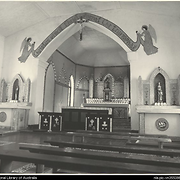 Sources used to compile this entry: To Remove and Protect: Aboriginal Lives Under Control [website], 2010, http://aiatsis.gov.au/collections/collections-online/digitised-collections/remove-and-protect; Beagle Bay Church at Beagle Bay, Western Australia, 1974 [picture] [Image], Creator: Jensen, Michael; Choo, Christine, Mission girls : Aboriginal women on Catholic missions in the Kimberley, Western Australia, 1900-1950, University of Western Australia Press, Crawley, Western Australia, 2001. pp.83-84, 152-153, 159, 160-161, 163, 178, 298-299.; Information Services, Department for Community Development, 'pp.97-99, Table 2: Young People at Beagle Bay Mission, 1959 to 1970', Signposts: A Guide for Children and Young People in Care in WA from 1920, Government of Western Australia, 2004, http://signposts.cpfs.wa.gov.au/pdf/pdf.aspx; Longworth, Alison, Was it worthwhile?, An historical analysis of five women missionaries and their encounters with the Nyungar people of south-west Australia, Murdoch University, Murdoch, Western Australia, 2005, http://researchrepository.murdoch.edu.au/163/2/02Whole.pdf. pp.298-299. ; State Solicitor's Office of Western Australia, 'pp.16-18', Guide to Institutions Attended by Aboriginal People in Western Australia, Government of Western Australia, 2005, http://web.archive.org/web/20140126131607/http://www.dpc.wa.gov.au/lantu/MediaPublications/Documents/Guide-to-Institutions-attended-by-Aboriginal-people-in-WA-2005.pdf; 'Western Australia Protectors Reports 1899-1959', in To Remove and Protect: Aboriginal Lives Under Control [website], Australian Institute of Aboriginal and Torres Strait Islander Studies, National Library of Australia, http://aiatsis.gov.au/collections/collections-online/digitised-collections/remove-and-protect/western-australia. Aborigines Department. Report for financial year ending 30th June, 1899, p.10; Aborigines Department. Report for financial year ending 30th June, 1907, pp.7-8. ; Personal communication with Neill Carter of the Kimberley Aboriginal Law and Cultural Centre (Kalacc) who described Beagle Bay Mission as a 'Stolen Generations Mission', 16 September 2014.